Me and my little beach hut studio... my happy place. One of my favourite Instagrammers Kayte Ferris from @simpleandseason has just launched her own podcast called 'Grow with Soul' - and it's flipping brilliant. I found @simpleandseason early on in my Instagram journey - due to her gorgeous images of cups of tea - and thank goodness I did. Kayte is a coach and mentor for small creative businesses, not to mention a marketing genius. She makes marketing not a dirty word (excuse the terrible grammar!). As a former marketeer myself I know the importance good marketing can have on your success as a brand but Kayte is a real expert at teaching us how to grow our little empires without all the icky feelings we sometimes experience when we are trying to put ourselves out there; making a living from our work without selling our soul. In her first episode Kayte talks about our 'Why'. Why we do what we do becomes the foundation stone of everything. It is *THE most important question we should all be asking ourselves as a maker*. You must have a clear grasp of your 'why' in order to differentiate your products from the rest. Why should people buy a mug from me over the 100s of other makers and brands? Yes, I stand by the high quality of my work and the colours are pretty but I am sure you could buy a good quality, pretty mug for half the price from Ikea (or any other homeware store for that matter)- so why should/do customers come back to me time and time again?...well, it's my 'why'. Since the beginning, I always had a strong sense of my identity as a maker and my brand and I am sure my background in brand marketing helped to formulate this. 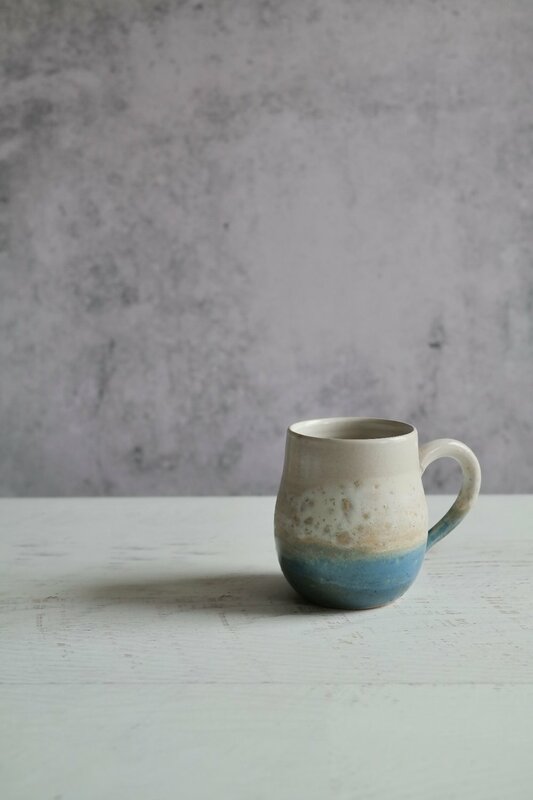 'I make pottery inspired by the colours and textures of the Devon Beaches I grew up by' but until I listened to Kayte's podcast I never sat down and actually wrote down my 'why'. Why do I *actually* do what I do, and why should someone buy from me? 4 Year Old: Why do you do what you do? Me: ...because I like making pottery. 4 Year Old: but why? Me: '...I like making pottery because I love being surrounded by handmade things'. 4 Year Old: but why do you like feeling like part of an artistic community? Me:'...because it makes me feel free'. I personally, alongside making pottery, I feel my most free and happy when I am by the sea - and without actually being on the beach 24/7; interweaving the colours and textures into my work is the next best thing. So, basically making costal-inspired pottery for a living makes me feel like a 'bohemian nomad with a creative soul- who lives by the sea' ' However unpractical it sounds pretty flipping idilic doesn't it? And if I didn't actually make my mugs I would sure as hell buy one to taste just a bit of that life! ;-) and I hope that maybe if you buy, use or just look at a piece of my pottery you get transported to your happy place, and even if just for a moment whilst you have your morning tea, you feel free. If you are struggling with your own creative marketing I highly recommend Kayte as a coach. She shares so much of her knowledge and gives fantastic advice regularly via her simpleandseason.com/blog, her IG @simpleandseason and now her podcast search #growwithsoulpodcast in your podcast app. Recently, I was lucky enough to get a one to one coaching session with Kayte - it was recorded and will be shared with you guys as part of this podcast series. I talk to Kayte about overcoming some of the difficulties I have as a small creative business- such as: comparison, how to focus more and blogging with dyslexia. I hope the session helps some of you like it did me. Subscribe to her podcast to #growwithsoulpodcast now and listen to her first episode. As soon as the episode I am in is live, I will link to it from here. NB: I'd just like to say, this post is in no way sponsored or endorsed by Kayte, I just think she is ace.